Executioner #1 Truck Facts: 2002 Dodge Ram Pickup, 515ci supercharged Chrysler Hemi engine - 1500 horse power. Lenco air shift transmission, externally adjustableKS Nitro shocks, 4-link suspension and custom built axles with Detroit Locker differentials. MTRA Certified race truck valued at $110,000.00. Sponsors: McLeod USA Publishing Company, Lund Truck Accessories, KC Highlights, Competition Cams, Spies Hecker Automotive Finishes, Ramsey Winches, Valco Silicone Products, VP Racing Fuels, Fel-Pro Gaskets, High Performance Coatings, G&G Machine Shop, Tractech and Optima Batteries. 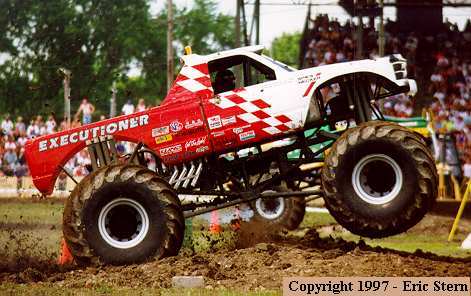 Were featured in a 1998 CBS Cable television documentary about Monster Trucks. Finished 5th in the 1996 PENDA points series. 1996 Truck of the Year. 1996 Most Improved Team of the Year. 1996 Driver of the Year - Mark Hall. 2001 Truck of the Year. 2001 Driver of the Year - Mark Hall. 2001 MTRA Safety Award - Tim Hall.